Based on Alexandre Dumas, fils’ 1848 play La Dame aux Camélias, reportedly informed by his own encounters with infamous Parisian courtesan Marie Duplessis, Francesco Maria Piave’s libretto follows a beautiful courtesan by the name of Violetta Valéry, who decides to sacrifice her sole chance of happiness by giving up her one true love at the behest of his father. Eyre’s production exploits stunning sets and costumes to evoke the indulgence, beauty and darker side of the 1850s Parisian glitterati’s frivolities, which form the backdrop to the doomed heroine’s tale: sumptuous gowns, dancing gypsies and matadors, and flowing wine fill colossal gold and red rooms, while extending hallways and sky high shuttered windows transport the action to grand interiors. Lebanese-Canadian soprano Joyce El-Khoury more than stands up to the role of Violetta, whose beauty, charm and, in turn, suffering, as a woman living on the margins of respectability, are a key allure of the narrative. From the opening scene where a life of hedonism is displayed, through to her clash with her lover’s father, from her humiliating return to a rampant social scene to her final demise, El-Khoury embodies the conflicted pulls of a young women between a life of pleasure, impossible choices in the name of love and confrontation with her own mortality. Her moving performance of Verdi’s distinctive and challenging arias (made famous in pop culture as the operatic songs that reduce Julia Roberts’s character Vivian, also a prostitute, to tears in Pretty Woman) demonstrate incredible control and range. 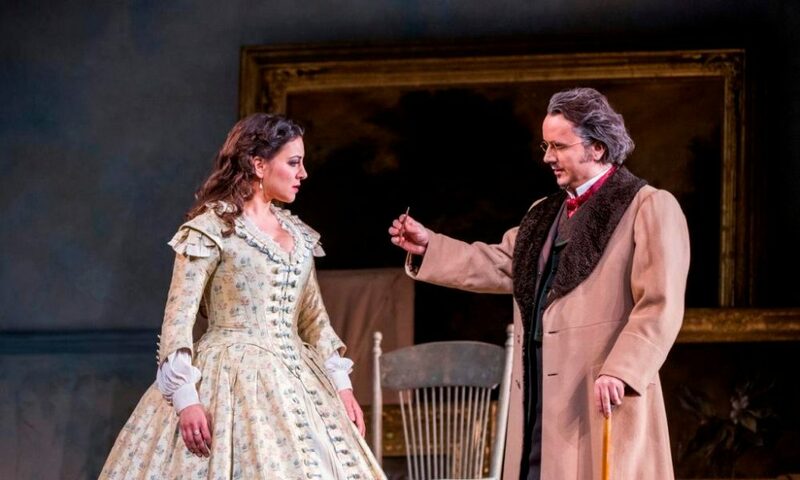 Crucially, the soprano’s onstage chemistry with Russian tenor Sergey Romansky – also making an impressive Royal Opera House debut as lover Alfredo Germont – is palpable, their duets and interactions variously filled with lust, tension, anger and grief. Opposite El-Khoury, Romansky emphasises Alfredo’s ardent love and obsessive passion for Violetta, turning to violent and bitter aggression when he is brought to doubt hers for him. Polish baritone Artur Rucinski is booming as the initially domineering but later repentant Giorgio Germont, Alfredo’s father. Italian conductor Daniele Rustioni, a Jette Parker Young Artist 2008-9, deftly handles the renowned score with the impeccable Royal Opera House orchestra and chorus at his command, bringing together a truly sensational rendition of Verdi’s composition. This timeless masterpiece, once boldly going where opera had not been before in its candid portrayal of vice and forbidden pleasures, with a saintly charactered courtesan as its protagonist, is brought to the stage once again with this classic production, where drama, tragedy and melody are all breathtakingly delivered. La Traviata is at the Royal Opera House from 16th January until 1st February 2017, for further information or to book visit here.